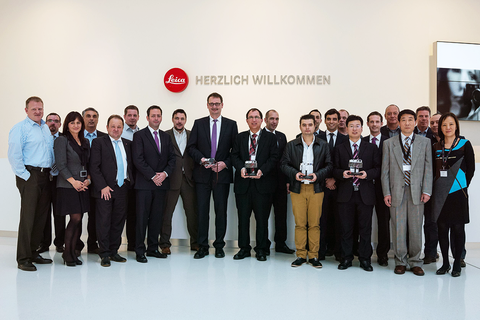 Leica Camera AG, Wetzlar, has honoured its best suppliers with the Leica Supplier Award 2014. The presentation of the awards in the form of a Leica M made of glass took place at the company’s headquarters in the Leitz Park in Wetzlar on 28 October 2014. The company first presented the award in 2013 and extended an invitation to suppliers to submit an entry in one of four different categories – supply performance, growth, value creation and innovation. ‘Today, the consistent, ongoing realisation of our growth strategy depends more than ever on the support of our suppliers. And the Leica Supplier Award is our way of honouring this in an appropriate manner. The multitude of submissions we received confirms our intent to continue the competition in the future’, said Ulrich Weigel, Divisional Manager Purchasing and Vice COO at Leica Camera AG. The winners of the Leica Suppliers Award 2014 are: Sà Couto & Monteiro S.A., Portugal (supply performance), Elmos Semiconductor AG, Germany (growth), Nanjing Jiangnan Novel Optics Co., Ltd, China (value creation) and Uwe Weller Feinwerktechnik GmbH, Germany (innovation). In the category ‘innovation’, the award did indeed come in the form of a Leica M system outfit, instead of a trophy made of glass. Here, the entrants were invited to submit suggestions for the areas of product and process innovation, quality improvement and time-to-market optimisation. Uwe Weller Feinwerktechnik GmbH, Germany, won the award with a suggestion pertaining to the market launch of the new Leica Summarit-M lenses, which were first unveiled at this year’s photokina in Cologne.